Last Saturday’s loss to Burton Albion has made that bump in the road encountered by successive cup defeats into something more closely resembling a pot-hole. An own goal may have been the difference between the two sides on the day, but it was a game in which we were thoroughly outclassed. With back-to-back league games coming up before an FA Cup exit-enforced break from action, Mark Robins would ideally be looking for a win in one of these upcoming games just to puncture the all-pervading pessimism that is never far away from descending over Coventry City. For the first time in a while, Mark Robins may well be justified in changing things up team selection-wise. While injuries probably limit the manager’s decision-making at the back, there are some major calls to be made further forward, albeit, Robins has to be careful not to throw everything good about our recent good run of form out of the window. The biggest call at the moment appears to be whether to stick or twist with Conor Chaplin. The forward’s all-round game suggests that the goals will eventually come, but Robins has a decision to make over whether to let Chaplin play himself into form or to give him time on the sidelines to avoid knocking his confidence any further. 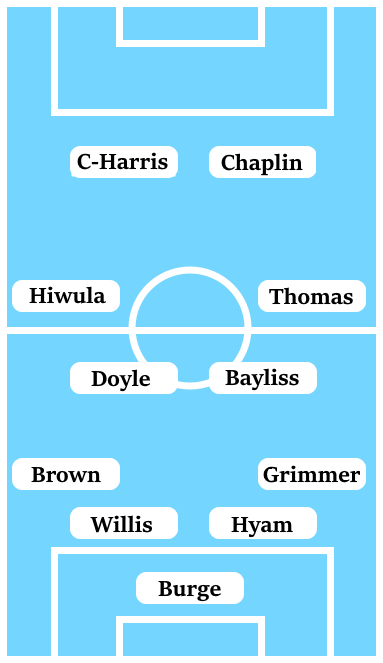 Jordy Hiwula appears to be the natural successor to Chaplin in the side, although Chaplin’s absence could also be used as an opportunity to tweak the tactics slightly. Elsewhere, it is probably a call between Jordy Hiwula or Jodi Jones for a position nominally on the left of midfield. Hiwula was conspicuously anonymous against Burton Albion and seems to be very much a hit-and-miss player, which always risks that dropping him costs us a potential moment of magic. Jones is still on a long road back from injury, probably more mentally than physically at this point, but this could be the time to see what he can do over 90 minutes in a meaningful game.